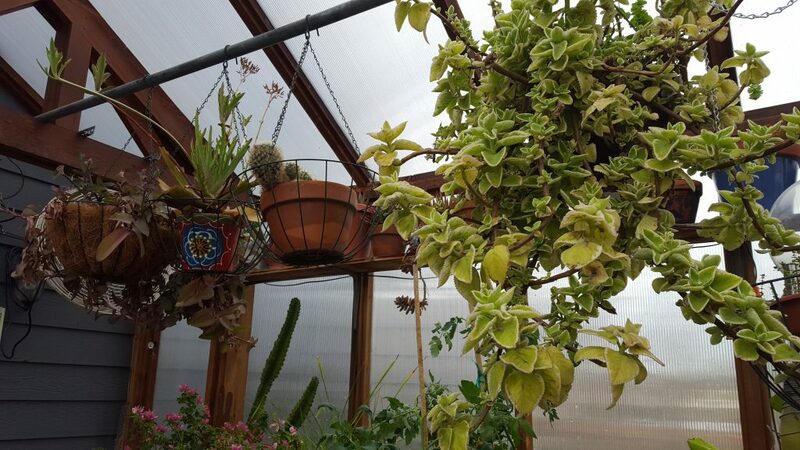 Hanging baskets in the greenhouse. 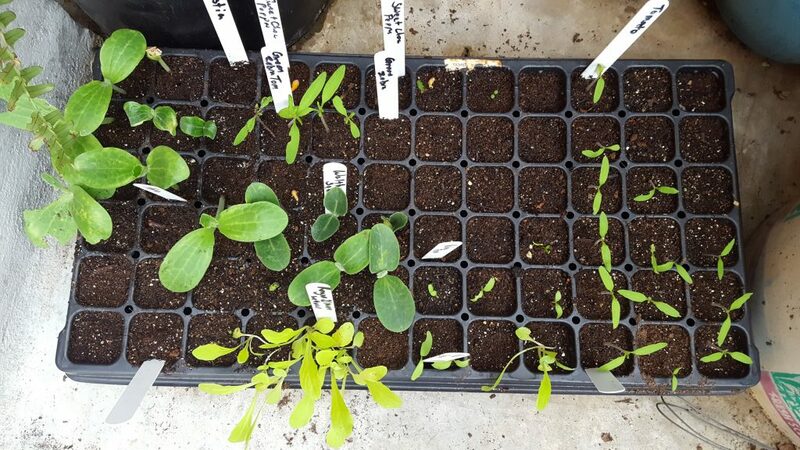 On March 3, I planted seeds in the green house. This post is mainly for my own benefit to keep track of what I planted and when I planted it. If you’re interested, read on. Astia Zucchini: I have grown these for the past five years. They are specifically good for containers but I have also had great results growing them in the garden. I love the foliage on these and the petite squash it produces. Waltham Butternut: Allegedly rare and heirloom variety, I snagged about 10 seeds. These are prized for the baking goodness and 3-6 lb. fruit. Nadia Eggplant: I’ve not had the best of luck with eggplants, but am giving it another go this time with this variety. They are supposed to be blemish free. Sweet Chocolate Peppers: This is a bell variety that has cola-colored flesh. They are supposed to be sweet and crunchy and good for salads. Yankee Peppers: These are an open pollinator variety which means (b/c I had to look it up) they will “breed true.” They’re medium sized red bell peppers. Japanese Climbing Cucumbers: These seeds were a Christmas gift from mom. We love these slender cukes and I like how they climb trellises. I usually grow these on cattle panels that we have curved over one of the gardens. Red Satin Radishes: These are a hybrid radish that as their name denotes are shiny and red with pure white meat. White Satin Carrots: These are a very pale yellow (or white) carrot. Porter Tomatoes: Also called “Old Reliable,” good for HOT climates. Cherry Romas: Prolific! I hope they’re good for sauces. German Tomatoes: These are good for slicing and can grow up to two pounds. Yum! Purple Plum: Also called “Chinese Purple Plum” these are a long tomato (about 2 inches long and 1 inch wide). They also look very prolific. Black Cherry: Another mom-harvested seed. They are said to look like large dusky-purple grapes. Cherokee Purple Cherries: Hmmm….These might have been mislabeled. I can’t find out much about Cherokee Purple Cherry Tomatoes. Does anyone know? Dwayne Beefsteak: This is another one that I am sure that we have grown before (and with seeds from mom) that I can’t find information on. Green Zebra Tomatoes: This is an heirloom variety that looks unripe but has a beautiful stripe and delicious flavor. Zukes, lettuces, and mystery tomatoes. So, most of the above seeds were harvested from mom and a few were sent to us by another relative. Marzano: These are a good paste and sauce tomato. I love growing these. Carmello: An early tomato (and hybrid) that is larger in size than some. Camaro: Another hybrid that claims to be resistance to Tomato Yellow Leaf Curl Virus. Mater: I’m ready for slices of this tomato on BLTs! Sweet Million: We actually ended up with two of these. (I think I put one in the basket and The Hubs snuck another one in.) These continue to produce until the first frost. Viva Italian: Another great sauce tomato. Matt’s Wild Cherry: A tinier cherry with a really sweet taste. These have grown tremendously and we had to stake them this past weekend. More tomatoes and more cucumbers. Wow. 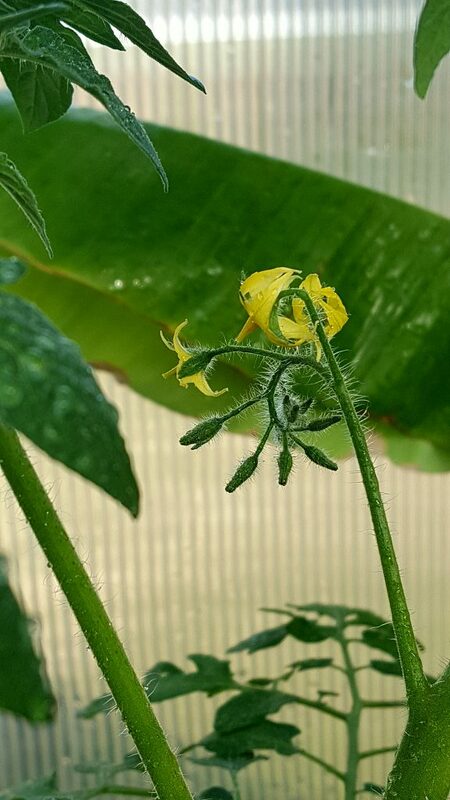 If everything grows and produces…..
wow Tomato plants are already blooming! Cool! I just keep mine near the window..now I wish I had a green house. You’re going to have a terrific garden! I’m always up for reading garden stuff, and love to see what other people are planting. You have some good stuff here! 🙂 Hope you have good weather and rain, and a bountiful harvest. We got the potatoes in on St. Pat’s Day. And I planted some more strawberries on Saturday. Then, Sunday, it froze. 🙁 Strawberries were mulched so I think they will be OK. Their a bit more cold hardy than some plants. I like this post. We don’t have a greenhouse but we had toyed with the idea of getting one years back. It gets so hot here, and early too, but i would love to get some plants in the ground. Looking forward to going on this garden journey with you! Keep those updates coming. The Dwayne Beefsteak is an heirloom that Dwayne has raised for 30 years. He starts about 350 each hear and gives many away. 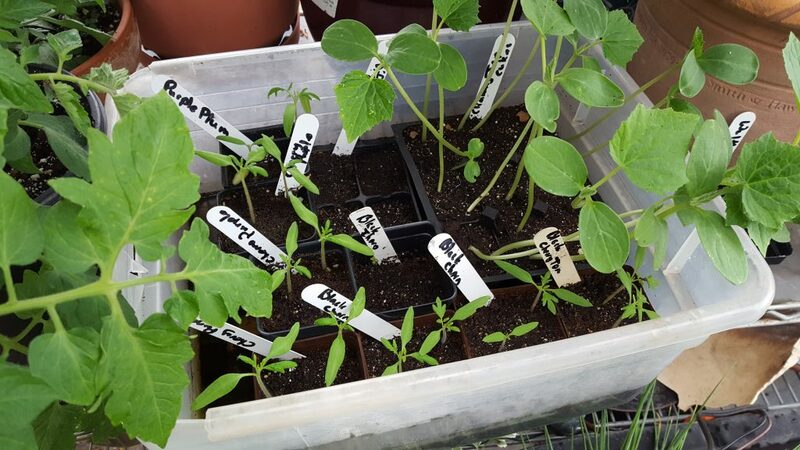 German Johnson is what seed savers thought they might be when he took one up there.Cherokee Purple is a beefsteak. Wow. Extensive planting and so much growth; exciting. The timing of your post could not be better as I wind my way through my own planting from seed and learning as I go (literally). I’m excited to see what comes, what works and what doesn’t, and may take a cue from you and blog about it sometime. 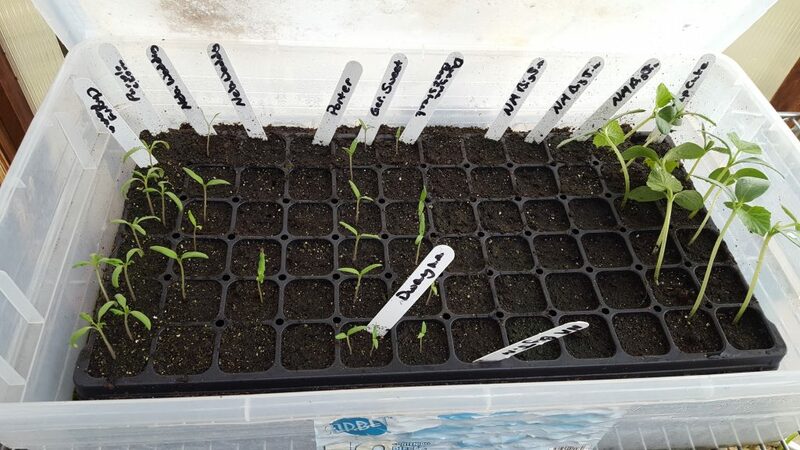 Your cucs & tomatoes look like they’re coming along fantastically. Congrats! The peppers are always slow to come it. I don’t know what I’m going to do with those cucumbers if it doesn’t warm up soon! They may start climbing the greenhouse shelves. I’m so jealous! To have a greenhouse would be wonderful. You certainly take advantage of yours. Love the plants you’ve selected. Am interested in some of those tomatoes and what a great selection of peppers! Can’t wait to see it all in a couple of months and throughout the summer.